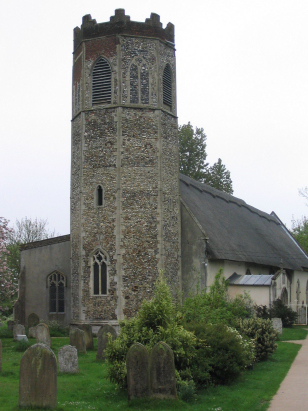 The parish of Old Buckenham lies in southern Norfolk about 3 miles south of the market town of Attleborough on the B1077 road which links Attleborough to Diss. Old Buckenham has some splendid village features notably its castle, certainly Norman and possibly earlier (Roman?) and its village green a splendid asset to the village. The village has a long and ancient history with many old farms dating back to Tudor and later times. A landmark too is its post mill which has the largest diameter of any in England. The village has all of its essential commercial assets too with shops and pubs a plenty, Old Buckenham is a thriving village and one of the pleasantest in Norfolk. 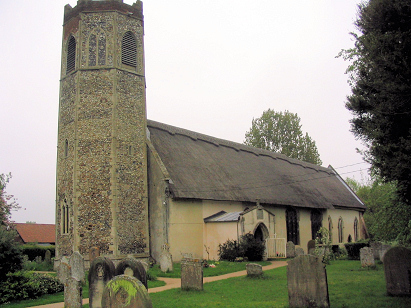 As befits a village with all of the above historical context All Saints church is an ancient foundation and one which shows features from architectural periods early for a Norfolk church. There are Norman details in the doorway and west wall, much which is Decorated in style and finally the almost de rigeur Perpendicular of the great period for Norfolk church building. The church is amongst the village and accessed through a lane from the green, tightly hemmed in by houses it does, however, present a challenge to see well and photograph adequately. As befits a large and populous village the register books for Old Buckenham covering the period of the transcript are of the standard 1600-entry form. The first begun in 1813 runs to the end of 1865 where a few entries are unused, the second commences in 1866 and runs through to the twentieth century. Both register books are filmed on Microfilm MF578 in the collection of the Norfolk Record Office and from which this transcript was prepared. The films are not of a modern vintage but are by and large adequate to the task, some birth dates written in the margin for the earliest period are rather faint and difficult to read. As a consequence and subject to that qualification this was a straightforward transcript t prepare and it is to be hoped few errors will have been introduced.